The new year is here and many of us have some fresh new goals or visions for ourselves, or maybe we just want to perfect something we love doing - maybe dance. There is a new business in the area that can help. 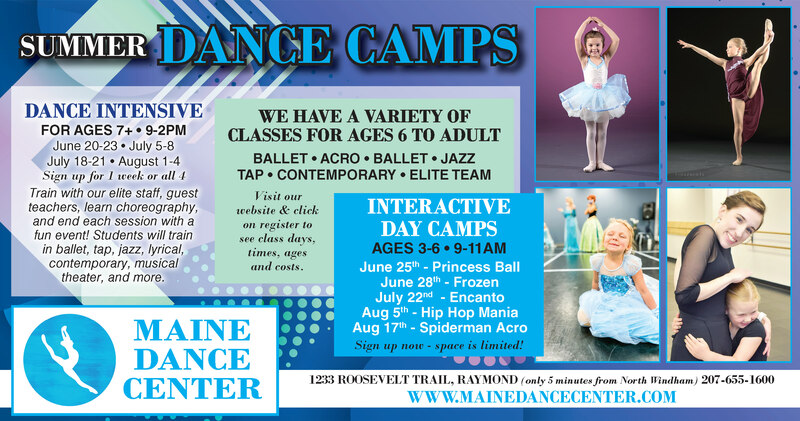 If you have or someone you know has a love for dance, then the new Maine Dance Center (MDC) is very close by and would love to help. Center Stage Performing Arts, ran for 15 years and is now under new management and has a new name. It is now the Maine Dance Center and it is in the same location in the Raymond Shopping Plaza, and now entering its 16th year. Rhiannon Pelletier, Artistic Director of the Maine Dance Center has been completely dedicated to dance for as long as she can remember. Rhiannon has been classically trained in ballet by Linda MacArthur Miele (a former pupil of George Balanchine and Artistic Director of the Maine State Ballet). She has also been formally trained in tap, jazz and musical theater. “Our focus at MDC is for all of our students to develop a lifelong love of dance. Anyone, at any age, can enjoy dancing and our goal is to nourish that joy in a wholesome family environment; while encouraging our more serious students to become the best dancers they can be. We offer an educational, challenging and fun classroom environment, conducted by an outstanding teaching faculty,” Rhiannon said. Rhiannon’s background is extensive with experiences that demonstrate her love of dance. She was born, raised and trained in Maine; and reached the pinnacle of her ballet career in her home state by achieving the title of Principal Ballerina with the Maine State Ballet at the age of 19. She was one of the youngest dancers to join the Maine State Ballet Company at age 14. This spring she will add the title role of “Cinderella” to her repertoire. She has been in programs with the American Academy of Ballet, Boston Ballet and continues to expand her training by attending workshops in Portland, Boston and New York. She has taught classes with local studios for over eight years and loves working with children of all ages. There is excitement in the air as Maine Dance Center will be releasing the summer schedule very soon. They will be hosting a Leap! Camp and a Princess Camp for little ones. There are many guest teachers planned as well as a lot of fun projects coming this summer! To learn more or to register for classes call 207-655-1600, email mainedancecenter@gmail.com or visit www.mainedancecenter.com. The studio is open weekdays from 3 p.m. to 8:30 p.m. and Saturdays from 8:30 a.m. to noon.